If there was a blue-black zombie dream team, these two creepers would be the all-star dynamic duo. Havengul Lich serves up unliving bodies into play, and Grimgrin slams them home back to the graveyard for a big benefit. And if Grimgrin’s your commander (he’s a really good one! ), this is really a one-card combo, rather than two, since you’ll always start the game with access to old Grim. 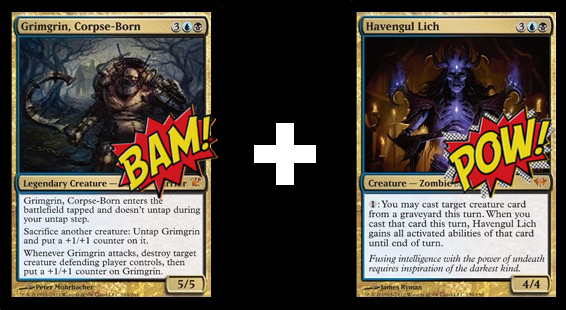 This combination seethes all the more putrid if you use Havengul Lich to resurrect slimeballs that actually make their home in the graveyard (like Bloodghast) or those who relish their own demise (like undying creatures such as Geralf’s Messenger). You can even use cheap-cost critters to repeat this scary cycle several instances a turn. How well do you remember your multiplication tables from 5th grade? Here’s a pop-quiz: What’s 5 x 3? That’s right, 15! 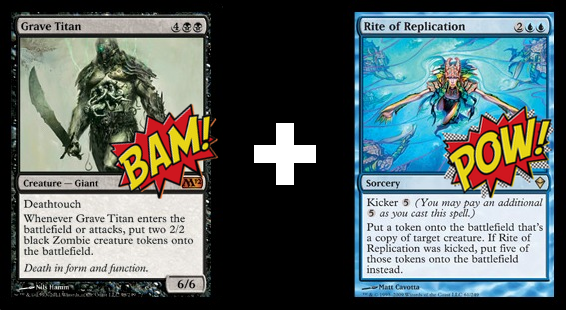 If you use Rite of Replication with its kicker cost on Grave Titan, you’ll have 15 little Johnny and Maggie zombies running around! Final exam time: What’s 10 x 5? Yes indeed: this combination earns you a heaping 50 power worth of drudging zombies and giants. This duo may not look like the scariest thing ever, but it’s a really fine way to finish a game. With Dire Undercurrents out, Oona has the ability to drain your most threatening opponent of the cards in their hand while stockpiling your own hand with useful spells. And all this while building an army of faeries that will kill unexpectedly quick. As you’ve may have experienced, one-color Commander decks seem to be pretty popular. This makes Oona, Queen of the Fae especially effective. 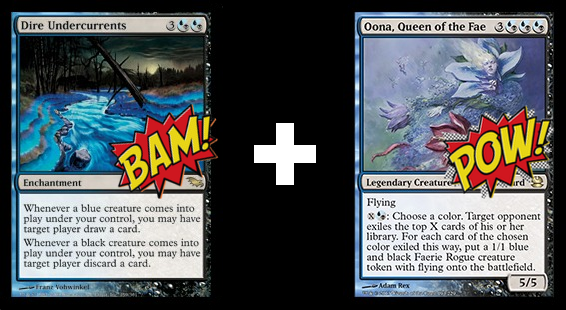 If you’re targeting a one-color deck with Oona’s ability, then before you know it, every last opponent will be empty handed and playing from the top of their deck. So there you have it! Three one-two punches you can try pulling on your friends in your blue-black deck. 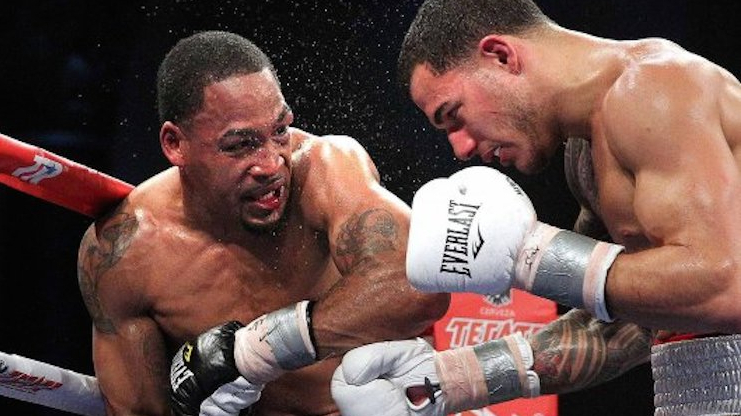 What are your favorite one-two punches in the land of Dimir? Let me know in the comments section below.